"2nd visit and Brocard didn’t disappoint with 6 thirties in a morning amongst our 28 fish week . Frank is very helpful and welcoming and takes pride in his lake , with very clean facilities what more could you want ? We will be back in the summer so see you soon Brocard. 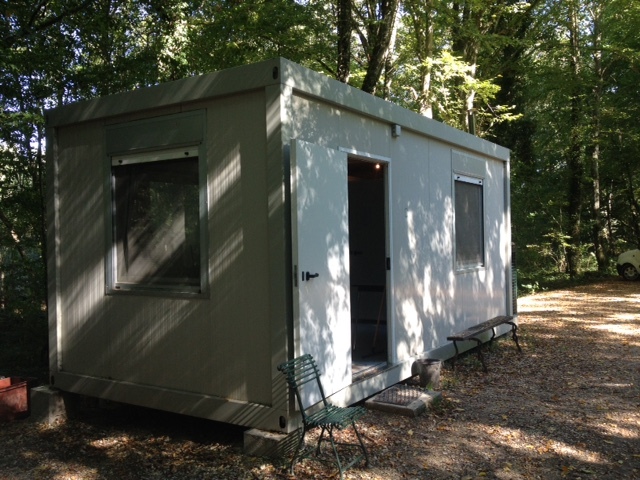 Phil &Trudi "
"Well kept lake with some good fish in great condition ,clean toilets ect, happy and helpful Bailiff a very enjoyable stay and will be re booking next year "
Domaine de Brocard is one of our most successful venues in France. No wonder the best pegs are already booked one year in advance. This former hunting domain, with a surface of 300 hectares, consists of 3 lakes surrounded by woodlands. On the first 8 hectare lake a maximum of 8 anglers can enjoy fishing from 4 pegs. They are situated on the south bank where anglers can fish without any possibility of snagging others lines. The gravel path provides good access to the pegs. The lake features over-hanging trees and reed-lined margins and on peg 1 there are some lily pads on the left side. Peg 1 is the only one-angler-peg of the venue. This first lake is stocked with 360 carp between 10 - 55 pounds. Maximum depth is 2 m.
In the 2 hectare nurse-pond, fishing is not allowed. 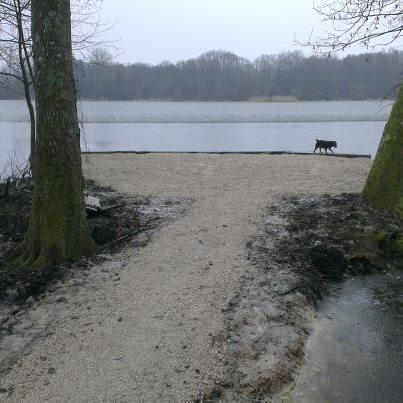 The third lake has a surface of 16 hectares and has a good access via a gravel path. Pegs 9 and 10 however can have a more difficult access by car when it rains. The tents stand on wooden pontoons. This lake is not deep, on average there's 1.5 m water and the bottom is soft without obstacles. Between pegs 6 and 7 lies a little island. Swim 12 is new for the 2007 season. Just like the first lake, there are over-hanging trees, reed-lined margins and lily pads in several areas. There are neither freshwater mussels nor crayfish. Take into account that there might be some weed formation when the water gets warmer (end of may, june...). This lake is stocked with 500 carp between 10 and 50 pounds. 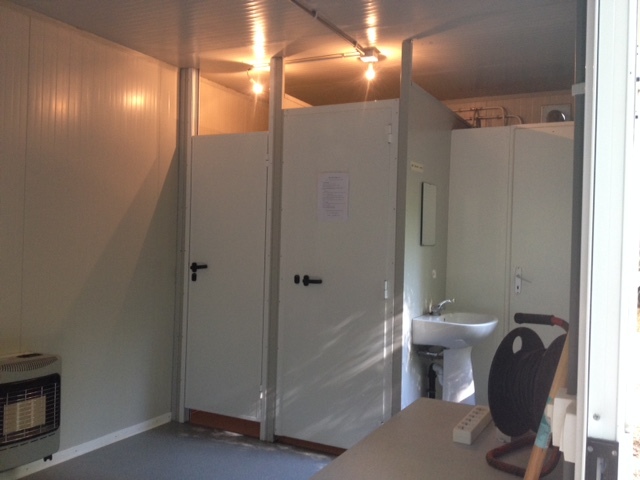 On the site there is a new bloc with shower, washbasin and WC. There's electricity for your batteries and mobile phones and there's hot water in the shower. You are alowed to bring a small generator for your comfort. On arrival every angler has to show his unhooking mat, his landing net and his weigh sling to desinfect them, to avoid possible carp viruses. Try to have these items ready on arrival. · Rods. Maximum 3 rods plus one light float or quiver rod per angler. The fourth rod CANNOT be fished with live bait, dead bait, boilies or a bite alarm. · Unhooking Mat: Carp Cradles or thick mats, min size 30” x 38” (70 cm x 90 cm) and at least 1.5” (4 cm) thick with padded shoulders. Please have a container filled with lake-water to hand for pre-wetting the mat to minimise stress and damage to the fish. 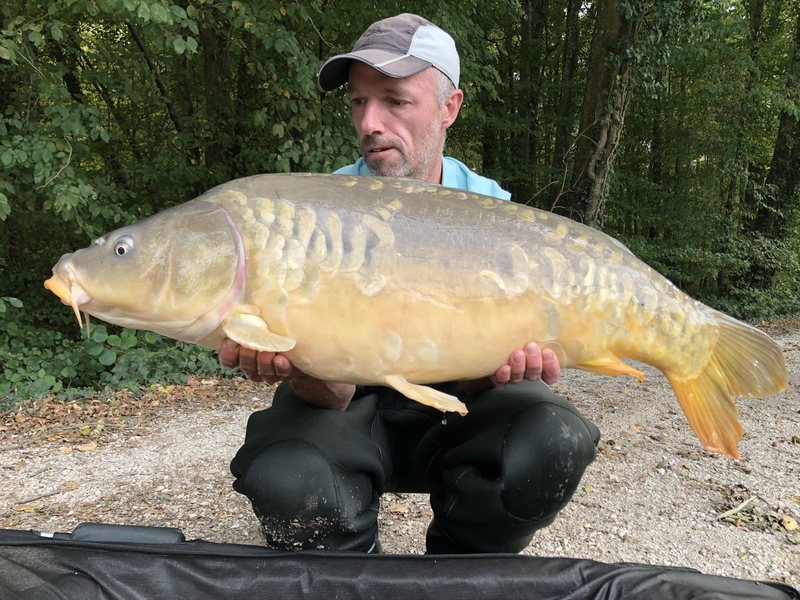 · Landing net: Large, min 42” (90 cm) arms. (Aluminium spreader block recommended). · Weigh Sling: Large PVC slings only.
. Hooks: Maximum size 2, minimum size 6. Simple pattern barb less only, flattened barbs or bent hooks are not acceptable. · Chest Waders: Chest Waders are compulsory to land the fish safely.
. Torches: to have both hands available use headlamps only. · BIVVY/ TENTS. Angler’s shelters must be green or camouflage.
. DESINFECTANT: For treating hook wounds please.
. Bring Flip-Flops for the showers. Not allowed : Carp sacks. Should you be found in possession of a carp sack, you will be escorted from the lake immediately. uncooked or not entirely cooked particles. These have to be cooked or weakened until the core is soft. Snab, shock or lead core leaders. The main line must be tied direct to the hook link swivel. Please hold the carp above the unhooking mat when making pictures. We don’t want to make fishing impossible, these measures are only meant to treat the fish with maximum of respect. · If you leave your swim you must reel in your rods. weigh sling) so you can return the fish within 5 minutes after having desinfected the hook wounds. The mutilation of fish is STRICTLY forbitten. Anglers found mutilating fish will forfeit their deposit, further non-compliance results with being escorted from the lake . · Please respect the tranquillity of the site, and the beauty of the nature within this. National Park. Garbage in the containers next to the sanitary please.
. Headlamps on the pontons.
. Should you wish to secure your bivvy to the ponton you will need cup hooks (nails are not allowed). 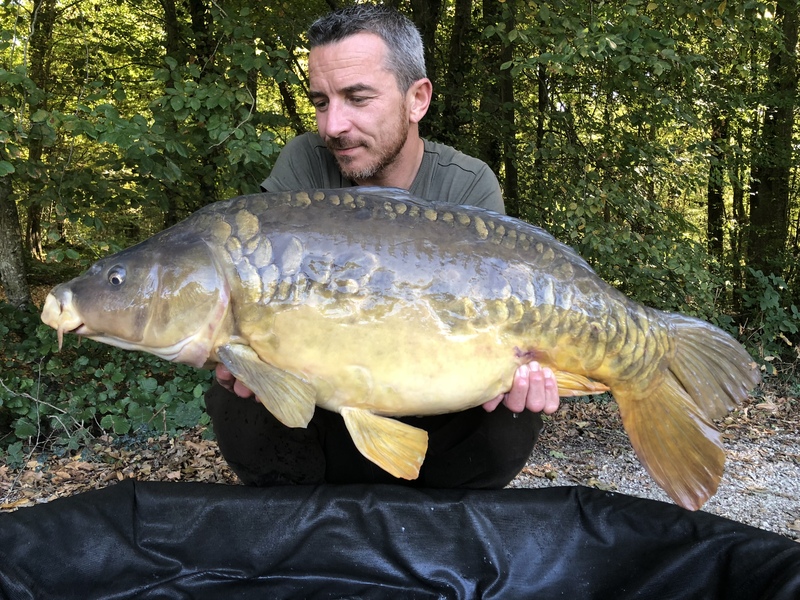 · Dumping left over bait into the lake is prohibited.
. On arrival you will be asked to pay a refundable deposit of 50 euros and asked to sign a contract to abide by these regulations. The bailiff will help you with all your doubts and questions and will help you have an excellent journey. Anglers found to be breaking the rules will forfeit their deposit, further non-compliance results with being escorted from the lake.